Handicraft has been existed from the beginning of the human being depending on the environment conditions. It has given its first samples for protecting, covering human beings and providing with the necessities of them. The handicrafts, which has later improved and changed according to the environment conditions, has gained "traditional" character by becoming an art which reflects the artistic sense of taste and cultural characteristics of the community. Traditional Turkish Hand Crafts has formed a rich mosaic by bringing together its genuine values with the cultural heritage of the different civilizations which were coming from the thousand years of history of the Anatolia.. 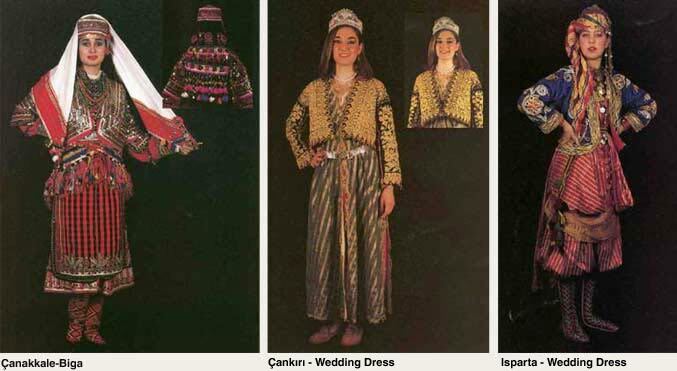 Traditional Turkish Hand Crafts can be listed as; carpet making, rug making, sumac, cloth waiving, writing, tile making, ceramic-pottery, handwork making, making embroidery, leather manufacturing, music instrument making, masonry, coppersmith, basket making, saddle making, mining, felt making, weaving, wood handicraft, cart making etc. The raw material of the weaving is provided from the wool, mohair, cotton, bristle and silk. The raw material of the weaving is provided from the wool, mohair, cotton, bristle and silk. Weaving can be every kind of cloth, plait, carpet, rug, felt which are obtained by spinning thread or connecting the fibers together by other methods. The weaving is a handicraft, which has been made in Anatolia for a long time and was made for a living and still being made for a living in many regions. The embroideries, which are one of the delicate samples of our handicrafts, are being used also as a communication tool with their meaning carried other then decoration. Those of the embroideries made with tools such as crochet needle, needle, shuttle, hairpin designed either as a border or motif, are called with different names according to the tool used and technique. These are can be listed as; needle, crochet needle, shuttle, hairpin, silk cocoon, wool, candle stick, bead and cloth left over. 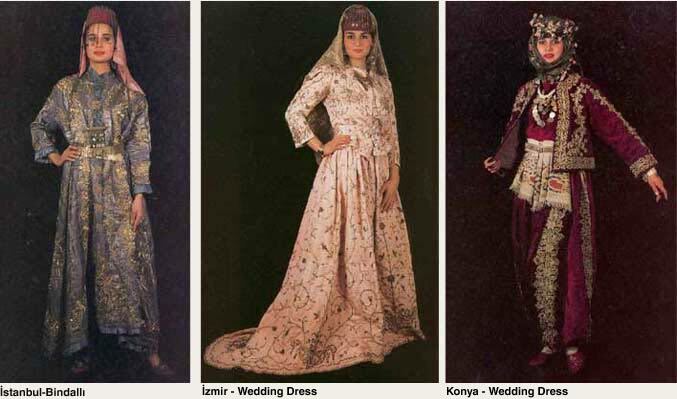 These have been made mostly in our districts such as Kastamonu, Konya, Elazıg, Bursa, Bitlis, Gaziantep, İzmir, Ankara, Bolu, Kahramanmaraş, Aydın, İçel, Tokat, Kütahya but they try to exist in trousseau chests since they are loosing their former importance. 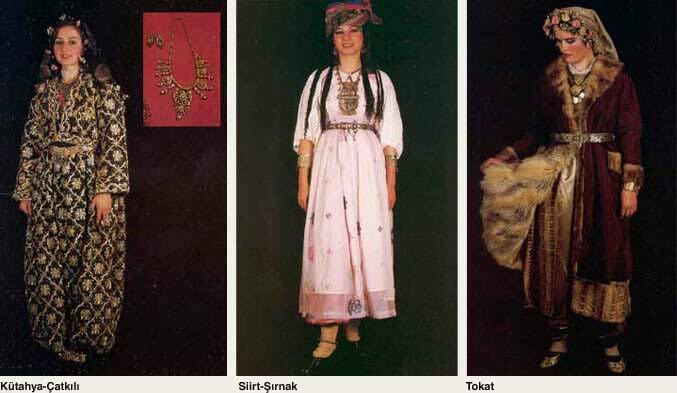 Along with our embroideries used with the traditional costumes the "takı", which are put around one's neck, are also the important accessories. All civilizations lived in Anatolia, have produced works of art having artistic value with precious and semi precious stones by either working up with metals or separately. 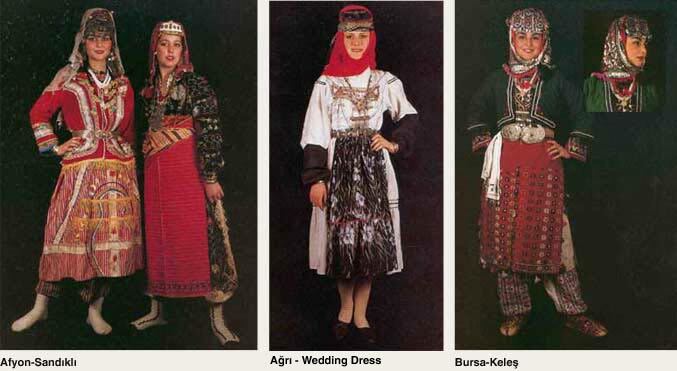 The most importance of the various methods which have come with Seljuks are Turkmen Takı. At the Ottoman period the jewelry has gained importance in parallel to the development of the Empire. After the periods of the Bronze Age in Anatolia when the bronze have been obtained by mixing the tin with copper, the materials such as copper, gold, silver have been also worked up by using the cast and wrought technique. The most used material is copper. The techniques such as wrought, scraping, savaklama (engraving in black on silver) have been used. The handicrafts made with copper, as well as the metals such as brass, gold, silver, are tried to be kept alive today by using high quality workmanship and various designs. The copper, which is the most widespread metal work up used today, is continued to be used by making cookware by tin foiling it. The architect created from the sheltering requirement has been designed and increased in varieties according to the conditions of the environment. The wooden workmanship, developed depending on that, has reached a characteristic quality unique to itself in Seljuk period. The wooden arts in Seljuks and rank of rulers are mostly the architectural elements such as niche of a mosque indicating the direction of Mecca, mosque door, cupboard covers and have included high quality workmanship. In Ottoman period these have been applied mostly in ever day used objects such as tripod, wooden stand for a quilted turban, writing set, drawer, chest, spoon, throne, rowboat, low reading desk, Koran cover and architectural work of arts such as window, wardrobe cover, beam, console, ceiling, niche of a mosque indicating the direction of Mecca, pulpit, coffin. The material used in the wooden workmanship is mostly walnut, apple, pear, cedar, ebony and rose tree. The wooden objects worked by the techniques such as tapping, painting, relief-engrave, cage, coating, burning are still used nowadays. The usage of the walking stick and stick batons which are made by using these techniques still used in districts such as Zonguldak, Bitlis, Gaziantep, Bursa, İstanbul-Beykoz, Ordu have been lasted hundreds of years and became very common in 19th century. The handles of the walking sticks and stick batons are made of materials such as silver, gold, bone and the body part are made of wood such as rose, cherry, ebony, bamboo, reed etc. trees. The other work art branch developed as depending on the architecture is glazed tile art. It was brought in Anatolia by Seljuks. The Seljuks artisans who were not hesitated to use figured work of arts were very successful especially in animal description. The glazed tile art initiated in 14th century in İznik, 15th century in Kütahya, 17th century in Çanakkale, has brought new designs to the Ottoman period ceramic and glazed tile arts. The glazed tile and ceramic art between 14-19th century has gained word wide fame with its extraordinary creative workmanship. he most distinctive samples of the glass workmanship obtained from the Anatolian civilizations enlighten the development of the glass history. The vitray in different models and forms has been developed in Seljuk period. In Ottoman Empire period İstanbul has become the center of the glass art center. Çeşmi-i Bülbül is one of the techniques, which has been able to arrive from that period to our days. First production of the glass as a bead for averting the evil eye has been achieved by the craftsmen of İzmir-Görele village. It is possible to see in every part of Anatolia beads for averting the evil eye. It is believed that the glances directed to the living creature or objects can be averted by the amulet. Because of that the amulets made of bead for averting the evil eye are put on the part of the living creature or the object where can be seen easily. Stone workmanship is takes important role in exterior and interior decoration in traditional architecture. The most used area of the stone workmanship other than the architecture is gravestone. The techniques such as carving, relief, script are applied. The ornamental motifs used are plants, geometric motifs and writing and figures. The animal figures are less. 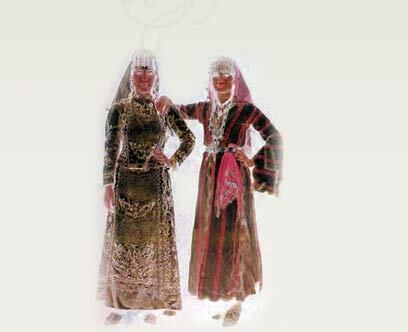 The human being figures are seen in Seljuk period. The basket making is made by weaving reed, willow, and nut branches as learnt by ancestors. It is started being used for inside home decoration other than carrying purpose. The saddles made of felt, rough clothes has formed a branch of the traditional artworks during the period when it was used widely at the rural areas dealing with livestock.